Channels snake between islands, occasionally branching into smaller, narrower channels to form confusing labyrinths. Many of the channels lead to wide bays, where bottle-nosed dolphins suddenly sprout, linger near the surface, and then disappear. Ospreys scream from their massive nests wedged in the crowns of large black or red mangroves. 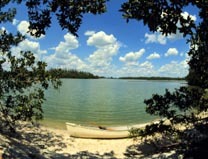 Other smaller, canopied channels, bathed in a green glow from light filtered through the interlacing tangle of mangrove branches overhead, lead to quiet backwater lakes. On calm days, the silence is almost absolute, broken only by an occasional croak from a night heron roosting in the mangroves or the crashing of a snook chasing finger mullet through shallows among the mangrove roots. by Jeff Ripple - The author of Southwest Florida's Wetland Wilderness.